Brief Update: Finally the firmware for this tracking device is at ‘Code Complete’ status. That doesn’t mean it’s finished! Having written the code, it’s time to enter the cycle of testing and debugging. So yesterday, I hooked everything up, and turned it on, and…. well nothing. The tracking radio is not hearing anything from the flight computer, so there must be a bug somewhere in the code which activates the radio. The planned flight is two weeks out, and unless I’m successful in debugging the device by this time next week, I may just have to call of the mission. This puts the pressure on a little, but I’m confident I can debug the issue in plenty of time. In truth, I did not expect this to work first time. 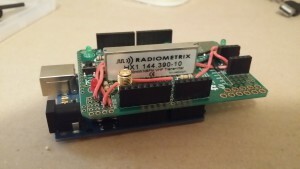 The AX.25 and APRS protocol support is not firmly based on the spec, but rather, they are both assembled based on a number of assumptions and some reverse engineering. There’s plenty of room for error, which would explain why nothing is working yet. None the less, the code complete status is a great milestone in the project. I now have hardware and software for the flight computer. After debugging and testing, I have everything I need to create a repeatable mission plan.